Looking for a way to boost up that color without spending an absolute fortune at the salon? Well, have I got the answer for you. 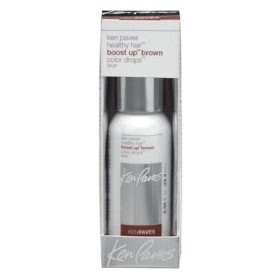 Give Ken Paves Healthy Hair Boost Up Color Drops a chance! This little bottle will do wonders for your tresses. Haven't heard of Ken Paves? He's the personal hairstylist to Jessica Simpson. And while I may not love her music, her movies or her outfit choices, I've gotta admit that her hair always rocks. So I'll give it up to Ken Paves, because the guy certainly knows what he's doing! I was personally thrilled when he decided to create his own line -- and this is totally the standout from the collection. Here's how this product works. You take the bottle and squeeze two drops into your normal conditioner. Emulsify the conditioner in your hands to mix the color in, and then apply to your hair as usual. Leave in for 1-2 minutes, rinse out, and voila! Your locks will be the same hue, just more saturated and a lot glossier. I've been using it in Brown, and I've gotta tell ya -- it is the absolute perfect shade for my hair. Each time I use it, it blends right in yet somehow still makes each and every strand glow and look just a bit more vibrant. I don't color my hair -- haven't in over 6 years -- but I feel like I've just gotten a glaze or gloss treatment every time I use this. It's best to use it once or twice a week. Any more and nothing bad will happen, but you won't really see any extra positive results. I'm LURVING these in Platinum and Honey!